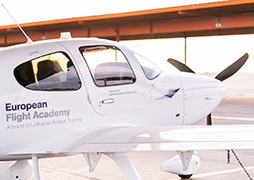 European Flight Academy trains the Lufthansa Group’s pilots of tomorrow. We prepare you to fly in a two-person cockpit right from the get-go of our multi-crew pilot license program (MPL). After about 24 months at European Flight Academy, you will be line-ready, including a type rating. With your completed MPL license, you will be able to work for any airline within the Lufthansa Group. You are interested? Then apply here. European Flight Academy has united Lufthansa Group’s flight academies under one roof since 2017. Today, the academy trains prospective pilots for all Lufthansa Group airlines on a fleet of more than 50 modern training aircraft stationed in Germany, Switzerland, and the USA. Our training courses follow one particular goal: to bring excellent pilots into the airlines’ cockpits. European Flight Academy is a brand of Lufthansa Aviation Training GmbH.